To avail of centralised printing facilities from your PC, check if the printers have been added to your PC. They will appear as CIT MONO and CIT COLOUR. You can send your documents to CIT COLOUR printer for colour printing or CIT MONO printer for black and white printing. All central locations use the CIT card system to allow access to copy/print/scan to email. In order to use the print stations in the college, scan your staff card at any kiosk card reader, which will authenticate and authorise your identity. 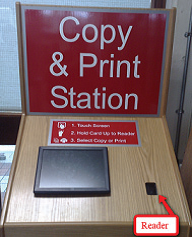 “Please Select a Function” will appear on the Copy & Print Station visual display unit, select print or copy. More detailed information on printing and copying here http://its.cit.ie/printing-photocopying. Issues with centralised printing and photocopying can be addressed by logging a support call or contact the IT Services helpdesk (ext. 5050). The Card Office caters for large scale printing and binding.